In the over forty years since Journey formed, the band has undergone its share of lineup changes with various members coming and going through the years. The current lineup, or as some would say the “modern” lineup is among the most solid in their 45-year history. Ross Valory on bass and drummer Steve Smith are one of the strongest rhythm sections in rock and roll and for good reason. They have been the backbone of Journey on and off for decades. Jonathan Cain, who joined the band before their commercial breakthrough with the Escape album in 1980, provides exquisite keyboards for some of the band’s best-known songs. Joining the band in 2007, vocalist Arnel Pineda is the virtual newcomer to the band. He achieves the near-impossible task of providing exceptional vocals to songs that have former vocalist Steve Perry’s mark all over them while making them his own. 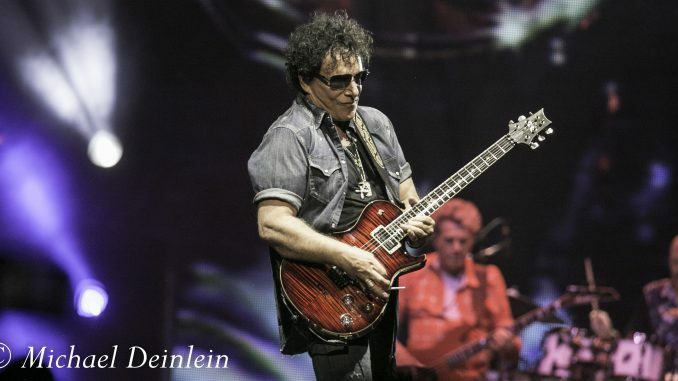 And then there is Neal Schon, guitarist extraordinaire, Grammy-nominated, Santana alumni and the only one there from the very beginning. Schon is not only the only remaining founding member but also has the distinction of being a presence on every tour and record that Journey has done. Given the band’s 45 year history, that is no mean feat. His constant presence can be felt in every Journey song. His guitar intros and riffs are instantly recognizable and uniquely his own. From the moment the house lights drop and the dark silhouettes of the band are seen on stage, this Louisville crowd is on its feet and ready to rock to the songs they know so well. Launching directly into “Separate Ways (Worlds Apart)”, followed by “Only the Young”, “Be Good To Yourself” and “Stone In Love” in rapid succession, Journey, lead by Neal Schon’s masterful guitar, has the crowd in the palm of their hand in no time. Everyone is on their feet, transported back in time, and ready for more and more of their favorites. They are not disappointed. Journey is on a mission to deliver as many power-packed tunes as possible, and that leaves little time for chit-chat from the stage. When it is time to introduce “Lights” from the hugely successful Infinity album, it is Schon who addresses the crowd. He playfully lifts his dark “shades” to survey the audience and tells the crowd to “get out your lighters or phones and light this place up.” Neal beams with approval as the venue fills with thousands of twinkling “lights” as the band launches into the song of the same name. This is one of many highlights of the set. It is difficult to identify THE highlight of the night, with moments such as the entire venue moving their arms back and forth to “Lovin’, Touchin’, Squeezin'”, Jonathan Cain’s beautiful keyboard solo incorporating snippets of classic Journey songs, Steve Smith’s dynamic drum solo which has the crowd cheering at the end, but then there is Neal Schon’s literal moment in the spotlight for his solo. Walking to the end of the catwalk, Schon, with the spotlight on him as the stage went dark, gives the audience an incredible display of guitar artistry. The intensity on his face, while he tore into his guitar solo was something to behold and the crowd goes wild. Eventually joined by Arnel Pineda as the solo leads into “Liberty”, it becomes an intimate and powerful performance of a song from 1983’s Frontiers album, perhaps not the best-known song of the night but definitely one that is a standout moment. Wrapping up the night is “Wheel in the Sky”, “Faithfully”, and the song that likely introduced Neal Schon and Journey to a younger generation thanks to its placement in The Sopranos finale, “Don’t Stop Believing”. No encore is needed. Neal Schon has shredded to maximum effect throughout the night and Journey has left it all on the stage. Everyone in the audience is definitely Believing as they head home. This show has been the very definition of rock and roll at its finest. When Neal Schon and Journey come back to Louisville, we will be ready.